The Clarkson Wastewater Treatment Facility is near the shore of Lake Ontario in Mississauga. 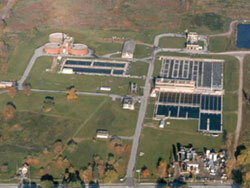 This plant processes the wastewater from homes and businesses on the west side of the Region of Peel. Three trunk sewers, with the total daily capacity of 163,500 cubic meters of wastewater, lead to the Clarkson plant for conventional and biosolids treatment. The thickened and dewatered solids are trucked to the Lakeview Wastewater Treatment Facility for incineration.